Blood spot tests are a new, minimally invasive, high tech and accurate alternative to conventional blood tests that require going to a lab and having vials of blood drawn. Visit our blood spot testing page to find out which tests are available. Sudden Infant Death Syndrome (SIDS), which is the leading cause of death in infants from one to six months of age, may be caused by gases coming from dirty crib mattresses. We feel that there is enough compelling evidence supporting this theory to share the information with you. More than a decade ago, Dr. T. James Sprott proposed the theory that the elements phosphorus, arsenic and antimony -- which are present in most crib and bassinet mattresses and covers, as well as in natural products such as sheepskin -- may interact with common mildew to produce dangerous gas that may poison susceptible babies. The solution for blocking exposure to these gases, and thus preventing SIDS, is to cover the mattress with natural-color polyethylene sheeting found at hardware stores. However, we had quite a bit of mail from our readers looking for an actual mattress cover rather than just a flat sheet of plastic. We have tracked down a crib mattress cover that meets Dr. Sprott’s specifications. When you purchase this cover from us, the manufacturer will donate a cover to the No More SIDS Foundation for distribution to a low income family or day care center, so your purchase will help more than one baby! Again, I want to emphasize that this is still a theory and we’re not making any guarantees about this mattress cover, but as you’ll read in the article (reprinted from the John R. Lee, M.D. Medical Letter -- see the More Info button), the evidence for its use is very convincing. But You Can With The Dr. Gauss Meter! Our information-packed interview with William Rea, M.D. about environmental illness and chemical overload in the John R. Lee, M.D. Medical Letter generated an amazing amount of interest. It seems that many of you can relate to the symptoms that Dr. Rea listed to describe environmental illness—especially sensitivity to fragrances. We also received quite a bit of mail asking about EMFs, or electromagnetic fields, which Dr. Rea mentioned as one cause of environmental illness. Many of you want to know how to detect EMFs, and it just so happens we have an answer for you. Fertile-Focus is a personal ovulation microscope that allows you to predict ovulation – your most fertile time of the month to conceive - with 98% accuracy. For quality, convenience and price, Fertile-Focus is the ideal personal ovulation micrscope. "It is accurate, reusable, and affordable". After testing many water test kits, this is the most accurate, simple and cost-effective one we’ve found. 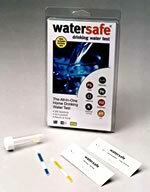 The Watersafe Drinking Water Test kit comes complete with all that you need to determine whether your water contains unsafe or undesirable levels of these common water pollutants: bacteria, lead, pesticides, nitrates/nitrites, chlorine, hardness and pH. Bacteria: Strains of E. Coli cause serious illness or death, especially in children. Lead: This heavy metal causes developmental damage in children, as well as neurological and kidney damage in all ages. Pesticides: They’re everywhere, and are linked to increased cancer rates, and are xenoestrogenic pollutants. This test is for atrazine and simazine, two of the most common pesticides used in the U.S.
Nitrates/nitrites: Come from fertilizers and animal waste. They can developmental problems in children. Chlorine: By-products can increase cancer risk; it’s bad for your skin and eyes, and it makes your water taste and smell bad. pH: High acidity in your water can cause lead and other heavy metals to leach from pipes and water mains, and can also damage your plumbing.